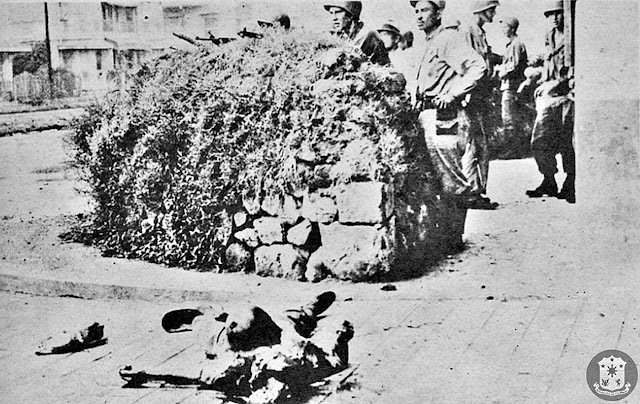 Original caption: American GI and Filipino guerrilla seem oblivious to slain Japanese soldier, with brains blown out, in front of Santo Tomas, University gate. Image source: Presidential Museum and Library PH on Flickr. During the Japanese occupation of the Philippines from 1942-1945, there were many guerrilla outfits that operated in the province of Batangas. The more notable of these were the Hunters/ROTC, the Filipino-American Irregular Troops (FAIT) and Emilio Macabuag’s Major Philips’ Unit. The operations of these outfits ranged from recruitment, protecting the general population from bandits, gathering intelligence or active combat such as sabotaging Japanese installations and ambushing Japanese troops. Many Filipinos had joined one or the other of these guerrilla outfits, but by 1943, circumstance forced them to lie low and become inactive. Initially, the Japanese tried to curb guerrilla activity by encouraging members to surrender and return to society with the promise that no punitive actions would be taken against them. Consequently, said Aubuchon, many guerrilla outfits stopped operations completely, although a few continued to function as home guards, maintaining the peace and order in their respective communities. By the latter part of 1944, however, news must have started to circulate in the grapevine that the tides of war had changed; and that the return of American armed forces was imminent. Consequently, many of the hibernating guerrilla groups not just in Batangas but also elsewhere started operating actively again. Some, like the Major Philips’ Unit, were receiving instructions directly from American intelligence operatives. Other guerrilla groups in Batangas saw this practice as a policy being employed by the US Army in the recognition of guerrilla outfits; i.e. “they felt that it was necessary to have been actively engaged in combat to gain recognition.” This ‘recognition’ would accord guerrillas from recognized outfits monetary, medical and other benefits given to army veterans. Late in 1945, however, the United States Army committed what other guerrilla units saw as a breach of its own policy. It announced that it was giving recognition to more men of the guerrilla unit called the Blue Eagle Command – an estimated 1,167 members of which had already been recognized – to raise the total to the brigade size of 6,269 guerrillas in all. 1 “Summary of Information Obtained on the Guerrilla Movement in the South Central Portion of Batangas Province,” by Lt. Leonard J. Aubuchon, dated 9 July 1946. 2 USAFFE stands for United States Army Forces in the Far East. Wikipedia. 3 According to the web site of Edwin Price Ramsey, a veteran, Straughn was, in fact, beheaded by the Japanese. 4 “Overview of the Philippine Commonwealth Army and Guerilla review process for individuals seeking VA Benefits,” online at the United States Department of Veteran Affairs. 5 Among those that were turned down were Emilio Macabuag’s Major Philips’ Unit, which was not only taking direct orders from American intelligence but also helped to pave the way for the Nasugbu Landing.